1753-1806. He was born in Devonport, Plymouth, the elder son of James Colnett who originally came from London, and of his wife, Sarah Lang. Colnett joined the navy as a seaman in June 1770 aboard the sloop Hazard, Commander James Orrok, later removing to the Scorpion, Lieutenant James Cook, on which he was employed from September to December 1771. He then transferred with Cook and many of the Scorpion’s crew to the Resolution, and was with the great explorer on his second voyage to the southern ocean from 1772-5. After returning home in the latter year Colnett saw brief service in home waters as a gunner aboard the Juno 32, Captain Hugh Dalrymple, and then from January 1776 as the master of the barque Adventure, Lieutenant John Hallum. He was commissioned lieutenant on 22 February 1779 and appointed to the Bienfaisant 64, Captain John MacBride, in which he served in the Channel fleet retreat of August 1779, fought at the Moonlight Battle off Cape St. Vincent on 16 January 1780, and was present at the capture of the French privateer Comte d’Artois 64 on 13 August. Continuing in the Bienfaisant until the peace, he was present under Captain Richard Braithwaite during the relief of Gibraltar on 12 April 1781, and at the Battle of the Doggersbank on 5 August, and with Captain John Howarth flying the flag of Rear-Admiral Sir John Lockhart Ross in the Channel during 1782, and at the relief of Gibraltar on 18 October. A short period of unemployment followed after the peace before Colnett’s posting to the Portsmouth guardship Pegasé 64, Captain Samuel Marshall, on which he remained until August 1786. Having next obtained Admiralty permission to take command of a commercial enterprise harvesting sea otter pelt off the Pacific coast of North America, Colnett set sail in October 1786 aboard a vessel called the Prince of Wales to spend the next couple of years trading between Queen Charlotte Sound, Hawaii and Canton. Here he became associated with a fur trader, John Mears, and it was decided to purchase their own vessel, the Argonaut, and attempt to open a trading post in Nookta Sound, on what is now known as Vancouver Island. However, on arriving in the sound he was arrested on 3 July 1789 as a result of a dispute with the leader of a Spanish expedition, Captain Don Estéban José Martinez, and this incident escalated into the Spanish Armament of 1790 which nearly brought about war between Britain and Spain. Colnett and his ship were eventually released from San Blas in Mexico in the summer of 1790 and were also compensated financially by the Spanish, and after a further period of trading he returned to England aboard an East Indiaman in April 1792. Between January 1793 and November 1794 Colnett commanded the sloop Rattler in a joint venture that was sponsored by the Admiralty and commercial interests to search for safe anchorages and ports for the British whaling fleet in the southern Pacific. In the course of this voyage he visited both Chile and the Galapagos Islands. After returning home he was promoted commander on 19 December 1794 and was appointed to the sloop Merlin. Four months later he transferred to the Hawk, and in undertaking an inspection of defences from the Thames to the Wash he directed the erection of batteries in liaison with the Board of Ordnance. Posted captain on 5 October 1796, Colnett’s new command, the frigate Hussar 28, was wrecked near the Ile de Batz on 27 December, whereupon he and his crew became prisoners of the French. During their captivity they were allowed only the same meagre provisions as the common criminals, were forcibly marched to various prisons, and were obliged to pay for essentials. Following Colnett’s release after six months of captivity he was examined by a court martial into the frigate’s loss and was acquitted, but he nevertheless remained unemployed for the next five and a half years. During his absence from active service Colnett spent some time producing a work entitled ‘Voyage to the South Seas’, which was published towards the end of the century, and which included a well-regarded passage on the treatment of yellow fever. In September 1802 he sailed from Portsmouth for New South Wales in command of the Glatton 54 with a crew of one hundred and seventy men, in addition to three times as many convicts and emigrants. 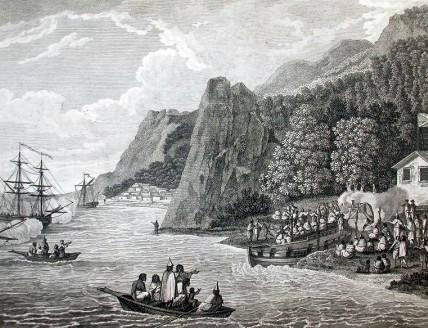 The Glatton reached Port Jackson in the following March after a voyage that was remarkably free of illness due to the preventative measures Colnett had employed, and by September 1803 she was back in the Downs, having returned via Cape Horn in record time with ship-timber specimens that had been requested by the Admiralty. An acknowledgement of his achievement came when shortly after his return home he was invited to dinner at Walmer Castle by the prime minister, William Pitt. After a short period as flag captain to Rear-Admiral James Vashon at the Nore in 1804 the Glatton was paid off on 7 March 1805. Colnett did not see any further service and he died in Great Ormond Street, London on 1 September 1806. He was buried at St. Dunstan’s, Stepney, the parish from where his father had originated. He had two daughters by his common-law wife, Catherine Aulte, one of whom predeceased him. His nephew, James Poate, acted as his servant from 1783-6. An early shipmate described Colnett as ‘clever and sober’.